If you love 80s arcade games, Buganoids HD is the iPad game for you. 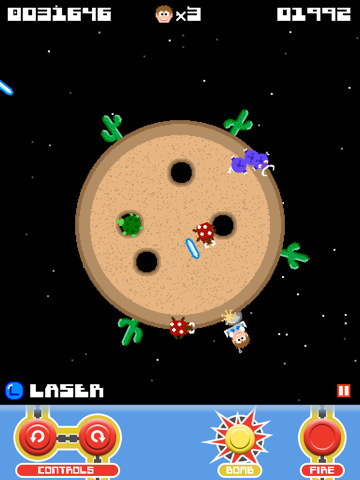 Buganoids HD from Backflip Studios is a cross between Dig Dug and Gyruss, like Space Invaders in reverse. Alien bugs are attempting to crawl out of the ground and get you, and its your job to make sure that doesn’t happen by blowing them up before they get to the surface. To accomplish this, you’ve got several types of weapons at your disposal: you start with a pellet gun, and then, by shooting power-ups, can end up with a flame thrower, laser, or guided missile launcher. The inherent wackiness of all this is well supported by the fact that you’re using red plasticky looking buttons on your iPad screen to spin your astronaut around the screen and another button to shoot your weapon of choice. The 8-bit sound effects, musical cues, and the bird that flies in overhead to attack from the opposite direction add to the offbeat comic book feel of this game. It is surprisingly addictive. 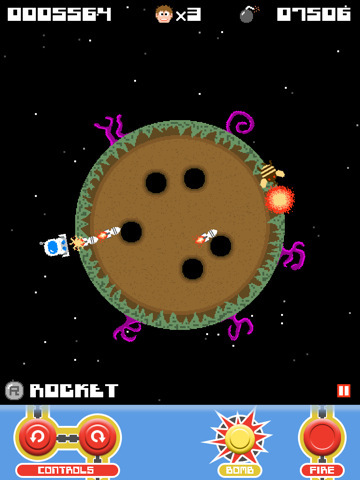 Buganoids HD is played with your iPad held in portrait orientation, with the game’s buttons at the bottom of the screen and a relatively unobtrusive ad at the top of the game screen. It is free, though there is a 99 cent in app upgrade to remove the ad banner. It supports OpenFeint leaderboards, multiple difficulty levels, and gets progressively more difficult within each level. As you move from planet to planet, the number and type of bugs attacking you grows and the action gets more frenentic. I highly recommend Buganoids HD on for iPad to anyone who wants a new spin on the addictiveness of the early arcade experience. Buganoids HD is pure retro goodness. Note to iPhone users: You can download Buganoids (Free) for the iPhone. AppSafari review of Buganoids HD was written by Chris Merrill on February 20th, 2011 and categorized under App Store, Arcade, Free, Games, iPad apps. Page viewed 3309 times, 1 so far today. Need help on using these apps? Please read the Help Page.